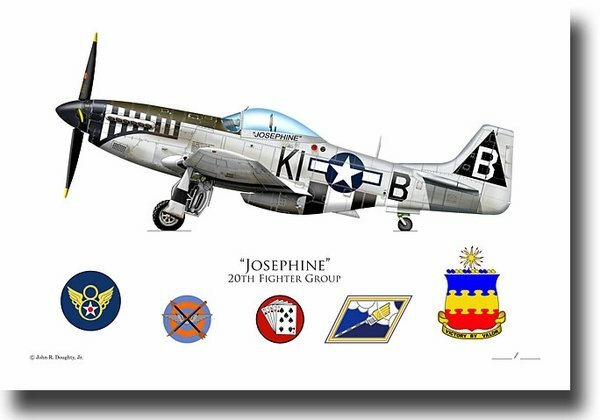 1st Lt. Joe Peterburs flew the P-51 Mustang (specifications) "Josephine" (44-15078) when he was assigned to the 55th Fighter Squadron, 20th Fighter Group, 8th USAAF in Europe. On April 10, 1945, while escorting B-17s to targets in the Oranienberg, Germany area, he shot down a Me 262 Luftwaffe jet flown by legendary fighter ace Walter Schuck. Later that same day, his P-51 was damaged while strafing a German airfield, and after bailing out, he was captured and became a POW. Walter Schuck was able to bail out of his Me 262 jet, and 60 years after that eventful day in the skies above Germany, Joe Peterburs and Walter Schuck met for the first time in Oceanside, California. Joseph Peterburs flew 49 combat missions in World War II, destroyed 5 enemy planes on the ground, and one in the air. He received the Legion of Merit, the Distinguished Flying Cross with 1 Oak Leaf cluster, the Bronze Star with 1 Oak Leaf cluster, the Air Medal with 7 Oak Leaf clusters, the Purple Heart with 1 Oak Leaf clusters, the Prisoner of War Medal, and 32 other medals and decorations. He retired after 36 years of active duty in the US Air Force. Mr. Joe Peterburs signed each print in 2008. The 20th Fighter Group, known as "The Loco Busters", was stationed at King's Cliffe, England, and consisted of the 55th, 77th, and 79th Fighter Squadrons. The 20th Fighter Group had 232 air-to-air victories. The three squadron logos and 20th Fighter Group logo are depicted on the print.